China has a new No.1 it will soon be able to claim, the world’s fastest supercomputer. 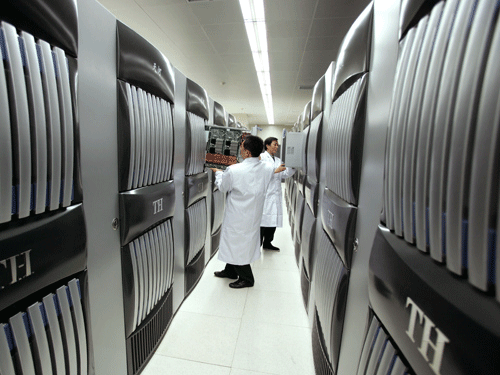 Located in the city of Tianjin, the supercomputer is modestly named Tianhe-1, which means Milky Way 1, according to a report from the AFP, and it calculates 2.507 petaflops (a thousand trillion calculations per second), making it some 40% faster than the previous world’s fastest supercomputer, Jaguar, a Cray XT5 supercomputer that is located in Oakridge National Laboratories, in Oakridge Tennessee. Designed by China’s National University of Defense Technology, Tianhe-1 is comprised of 7,168 Tesla graphics chips from Nvidia and 14,336 central processing units designed by Intel, according to CRN. In 2009, Tianhe-1 reached 500 trillion calculations per second (half a petaflop). Tianhe-1 is currently listed as No.1 in a listing maintained by the University of Tennessee, but the list isn’t officially closed until November 1st. With a 40% speed improvement over No. 2, however, it isn’t likely that any other computer is going to come out of the woodwork to displace Tianhe-1. Various officials attached to the supercomputer in China have said the device could be used in the animation industry, as well as for bio-medical research. In the meanwhile, the Tianjin Meteorological Bureau and the National Offshore Oil Corporation have already begun trials using the supercomputer. To recap, the world’s fastest supercomputer that was designed by the Chinese military will be used to make cartoons, design drugs, figure out weather patterns, and look for oil.